The following is a guest post about the cost of owning a car. If interested in submitting a guest post, please read my guest posting policy and then contact me. Purchasing a car can be a major expense, second only to buying a home for most consumers. It can be a useful asset, especially you love to travel by land. Like owning a home, owning a car also comes with the cost of maintenance and upkeep. What initially seems like a low starting purchase price can skyrocket over time when you factor in the added costs of insurance, maintenance, and fuel. For example, although a Dodge Journey SUV may cost $1,600 less than the comparable Toyota Highlander, according to Consumer Reports the Dodge will actually cost you $5,000 more in operating costs over a 5-year period. It’s helpful to take a closer look at all of these associated expenses to calculate the true cost of owning a car. This will help you better compare your options, for a realistic picture of what to budget. One of the most obvious costs you can expect to pay is fuel. This can really add up over time, particularly for larger cars and SUVs. Cars that require premium or diesel fuel will take a bite out of your budget, while hybrid vehicles will help offset their higher sticker price by lowering your fees. Gas accounts for nearly 25% of the full cost of car ownership over a period of five years, so it’s worth comparing mileage carefully to choose a lighter, more efficient car if possible. Although fuel may come to mind first, depreciation is actually the largest expense when you look at car ownership as a full package. It accounts for almost half of ownership costs over the first five years of owning a car, because the car’s value can fall so steeply. It’s estimated that the average model depreciates in value a whopping 65% in the first five years alone. To offset depreciation, you’ll want to compare models carefully and look at their resale values. Perennial bestsellers like the practical Toyota Prius tend to fare better over time when compared to sportier hatchbacks like a Suzuki SX4 or Mazda 3. Your insurance rates can vary widely, depending not only on the car you drive but also on your driving record, credit history, and location. However, some cars are easier to insure than others. A practical Skoda will always incur lower rates than a flashy BMW. If you have narrowed down your list of potential cars to a few top candidates, you’ll want to run these through insurance comparison tools to see how they measure up. It’s also worth shopping around to find the lowest insurance rates, because each provider has their own unique formula. If you’re purchasing a brand-new car, in most cases you won’t have to worry too much about costly repairs. However, to extend the lifespan of your car and fight depreciation it’s still important to take it in for regular maintenance. According to data from Consumer Reports, maintenance and repair costs make up 4 percent of the total ownership costs of an auto. Most costs are covered by a factory warranty during this time, but some vehicles still can incur higher costs than others. The Porsche Cayenne SUV can cost $4,000 in maintenance costs during five years of ownership, which is far higher than most others in its class. No matter what type of car you are driving, you can minimise your annual costs by keeping an eye on your budget, including how much you’re spending on maintenance services, insurance, and fuel. This will help you save money by keeping car ownership costs under control. With good and careful budgeting, your personal finances will surely take a turn for the better even if you own a car. Depreciation is a bigger factor in new cars than used cars. As soon as you drive your new car off the dealer lot, it loses some of its value. This is one cost you won’t notice right away, but when you’re ready to sell your car, it means you won’t be able to get as much money for it as you could if it was brand new. I agree. This is the single biggest reason why people who buy cars generally have a harder time building wealth. If you are buying a $30,000 brand new car and losing $8,000 in value the minute you ride it off the car, you need to be making much more that $40-50k to continue to maintain momentum towards building wealth. I know all about that mistake. I don’t see myself buying a brand new car again after seeing how much I lost from depreciation. Some new vehicles are especially bad for losing value to depreciation. Good post. Insurance was a pretty big factor when I bought my first car (still running). I made a list of all the car models and years I wanted. Narrowed them down to about 5 and called the insurance company. It was surprising to see how when we factored in some of the insurance costs, some of the cheaper cars were actually more expensive. I wish I had been so thorough when buying my current car. The insurance was incredibly high. Luckily it’s decreased a lot over the years due to a clean driving record. While electric cars may be the future of driving, I wouldn’t be so quick to buy one. The expensive batteries balance out a lot of the fuel savings. Where I live there simply aren’t enough places to charge them yet. I did the same analysis before purchasing my latest car, but I set a threshold of how much I would care. If two cars, for example, where without $2,000 of each other over a five year period I decided I would choose whichever I liked best overall. I mean, I have to drive the freakin’ thing, right? Yes you do still have to ultimately consider what you want to drive. If you focus it completely on price, there’s a good chance you won’t be happy with what you drive. Just by keeping up with regular car maintenance can help lower the true cost because you will have a lot fewer issues as the car gets older. Good point. If you neglect the required maintenance, things will get ugly quick. Don’t forget registration and inspection which, for two cars, would come in around $200 a year. That’s not something we have to do here in Canada. It is something to factor in if it is applicable to where you live though. Glad I read this today, it’s reminded me that my car is due for a service. I agree with Sean and Mr.CBB also brought it up in a comment the other day, regular maintenance is one of the simplest things you can do to bring down the long term costs of running a vehicle, yet so many people still ignore it. I’d have to say it’s also a reminder for me. I’m due for an oil change that I’ve been putting it off. As much as I’d rather not do it, I don’t want to pay more in the long run. Fuel is really 25% of the cost of ownership?? Damn!! I bought a 2003 Mustang when I was 20. I’ve driven it 140,000. Maintenance, other than routine, has been almost zero. I average 19 miles to the gallon, which isn’t bad for the car. I am paying $85 a month for insurance, which I bet is higher than what I could have. I’m not too surprised about that, but I’m sure many people would overlook it. I should have considered it more with my current car. I knew the financing and insurance would be pricey, but I didn’t consider how I’d be paying a lot for gas in the long term. Great post. I remember when I was in college and in need of a new car and was dumb enough at first to think I could afford a car payment! My brother was like, no you can’t… have you factored in insurance and maintenance? and then I realized I could not afford to buy a car. Young people especially might forget about the extra costs of vehicle ownership. It’s one thing to be able to afford the car payments, but affording to actually own a car is another story. Great post, this really helped me know the different costs a car owner needs to pay. I’m glad I haven’t paid for a car yet. I will certainly take note of those. With the amount of depreciation involved, I think I’ll just buy a secondhand car, instead of the brand new ones. Yep, definitely buy secondhand to save on depreciation and insurance. Just make sure it is in good condition otherwise the maintenance costs will balance it all out and cause big headaches. Just like with a house, there are a lot of expenses associated with a car that people don’t think about. Great list! Yes it is very much like buying a house. You have to look at the big picture instead of just the mortgage. Driving the car off the lot is bad enough, but hanging on to that car will cause your wallet to leak without you knowing it until you try to sell. Depreciation is the single biggest waste of money in America, and it’s all spent on shiny cars. UGH! For sure…it is a huge waste that far too many people put up with. The allure of a brand new vehicle is often too much. I think there does come a time with a car that was bought new that it is best to hold onto it to get more years of it rather than trying to sell it. You might as well get some years where it’s not costing as much rather than putting down the cash on another car. I bought a new car in my early twenties for about $22,000. Sold it 6 or 7 years later for $2,500. NEVER AGAIN. Ouch that is a massive drop in price. I thought my car dropping in value about 60% was bad. There are a ton of additional fees, in Europe you often pay a tax disc every year as well, and then there is the cost of small things your insurance won’t cover, like a stone breaking your windshield, or someone stealing your tire caps. It can get expensive. Sounds like the insurance is a lot different over there. Our insurance here has special rules for glass damage where it doesn’t affect your monthly premiums. I think stolen hubcaps or any other part attached to the car is covered too. Great points! I considered buying a used Mercedes Benz convertible but then starting talking to others about how expensive it is for maintenance and decided my next car will be a Honda instead! Glad to hear that you did your due diligence. Some foreign cars are quite expensive to maintain. Even an oil change can be pricey. My car definitely costs me quite a bit each month to maintain and run. I enjoy driving over taking transit, and probably wouldn’t give my car up, but it’s not cheap! Personally I don’t like dealing with heavy traffic. So I’d gladly take transit to work provided that the route isn’t too long. I had to drive this morning and I had forgotten how much I dislike driving downtown. That is especially true for first time car owners. Without any driving history insurance companies will charge a lot more to ensure you. Plus they tend to charge more for riskier drivers such as young people. So your first car insurance can be quite pricey. Good points to bring up! Wish you had written this a few months ago when I bought a new car! Yes I did…brand spanking new. Though…it ended up being the best option for us. -First we looked at different hybrids. We even considered Ford but eventually went with Toyota because their cars last forever! Ford…still not tested yet. -Second we went for a regular Prius. My husband is really tall and it was a bit small for him. So then we had to go for the larger size version Prius V.
-After that we looked for used models. None to be found as the model is fairly new. Looked at 2012’s…not worth it. -In the end, got a Prius V with 0% APR. The new vehicles these days do tend to get great gas mileage which could make it a lot more worthwhile. It sounds like a case where you were so set on a particular vehicle that you didn’t have much choice about going used. That is where things get more expensive. The people who are open to several options can often get a much better deals. Everyone knows that cars are expensive. In addition to the cost of acquisition, there’s maintenance, insurance and the ever-increasing cost of gasoline. 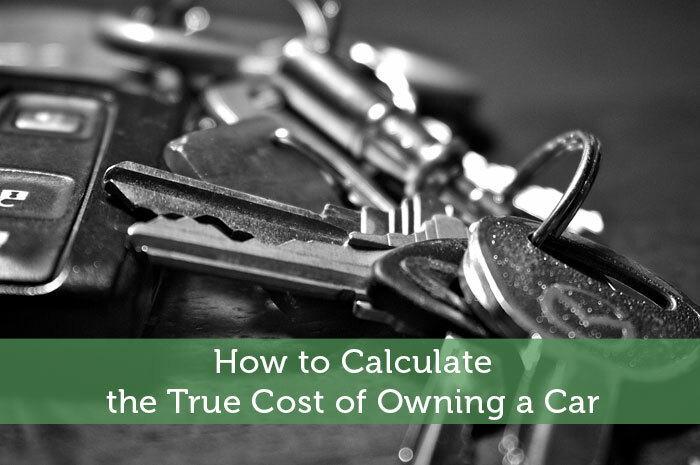 We all know that those costs add up, but few of us know exactly how much it really costs to own a car. It is a big tricky to really calculate beforehand as those costs aren’t established until you actually get the car and start driving it. All we can really do is some research beforehand and don’t commit to anything that may be cutting it close to fitting in your budget. I say buy used and even then get something a lot cheaper then you can actually afford. Maintenance for me is by far the biggest cost. Insurance is fairly cheap when you are driving a 96. Costs add up and like a home things can and will go wrong so plan for them. Going used is the smart move, but I’d be hesitant about a car that old. It’s likely at the age that a lot of maintenance is required. By just getting a used car that is 2-3 years old you get the savings without major work being due soon. Great post, I have also seen that many people think about buying new cars when in no situation to do so, thinking that it also acts as a storage of value. It does not. Yeah I don’t know why more people don’t realize that a car’s value drastically diminishes over time. It’s definitely not the best investment that they might assume. 10 years sounds like a good idea, but there is probably a magic number depending on the car where you want to sell it off. You don’t want to get hit with any major scheduled maintenance down the road. This is why I’m hunting for a used Toyota Corolla. I’ll get the most savings on gas, depreciation (used), and repairs (really reliable). I’d recommend to anyone to go for a used Toyota or Honda and spend your hard earned money on something else vs. getting from point A to point B.
I agree that a used Toyota or Honda is the way to go. I plan on going that route with my next car. There is definitely better things to spend money on than transportation. Do you think “leasing” is the better alternative to buying?